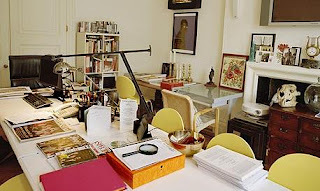 tragicabbot: What Makes A Room A Writer's Room? What Makes A Room A Writer's Room? "How did it happen? How did my lovely slick room get buried? How could books drive me out of my book room? It's just as well that I write in the same facile way wherever I am - no blocks or anguish, no contemplation, no elaborate revision, no need for love-tokens or nice views. Mine is street-level urban W1, but I usually close the shutters." Have You Ever Seen A Dragon Fly? Are You Socially Prepared for Flock? How Well Do You Understand?